Jana Hoobler, UB missionary in Macau, sent this update on June 30. “Our summer children’s classes are off to a great start. Beth Nelson, who volunteered with us last summer, is back again this year and is a huge help with the kids. The classes are almost all full, the kids are adorable, and I’m loving doing lots of teaching. Praise the Lord for the opportunity to influence these children for Him. “The adult English Language Program classes for the summer are also coming together well. We’re thankful for the adults we can impact through these classes. I’m teaching a Phonics class for adults. This class will continue until the end of July. Ken Himebaugh has been appointed senior pastor of Pleasant Valley UB (Lake Odessa, Mich.) effective August 1. Cluster leader Mark Ralph, pastor of Sunfield UB church (Sunfield, Mich.) will meet with Pleasant Valley’s personnel team in the next few weeks to work out the salary agreement. Howard Beaver has been named senior pastor of Mt. Olivet UB Church (Chambersburg, Pa.) effective July 15. Cluster leader Milt Herrold, pastor of Orrstown UB (Orrstown, Pa.), and the Personnel Relations Commission from Mt. Olivet worked through the processes needed to make this appointment. John Christophel, pastor of Brooklyn Park UB in Baltimore, Md., has suffered the loss of his father. Wayne Christophel, R., passed away June 27 from a heart attack. It was a shock, since he appeared to be improving after a transplant surgery. Address: John Christophel & Family, 124 W. Hilltop Road, Baltimore, MD 21225. 28 Jun How Big is Your County? First, I acknowledged that it is true that larger churches can provide some services and ministries that a smaller church is not at the point of doing. For example, in my first church, we had families come that had teenagers. We were a small church plant whose oldest children were in fourth grade at the time. We concluded that we were not going to be able to reach or retain families with teens until our children grew to be teens. I helped those families that visited us who had teens to get into a good church down the street. In this way, that church was a partner, not a threat. We kept those folks for the Kingdom, just not in our building. The answer for that group was over 350,000. Studies suggest that over 50% of them probably do not have a meaningful relationship to Jesus Christ. That means that there are perhaps 180,000 people near this church who are pre-Christian and need the Gospel. It is also true that there are likely a significant number of people out of that 180,000 who are similar to the people currently in the church (stage of life, age, background, etc) and would be drawn to become part of their church, if it was clear they could meet the Lord in that place. Therefore, you could fill all the large or mega-churches in that area numerous times and still have tens of thousands of people yet to be reached. Other churches are our teammates, not our competition. How many people are in YOUR county? Perhaps not as many as in that one, but enough that you have an ample group to reach. The greater question is whether or not your church is a place where the presence of the Lord is evident. A second question: What is your church intentionally doing to reach those who are already connected to you through relationships at work, home, etc.? I am currently in San Francisco at a conference. We attended church at First Baptist Church of San Francisco, which is located directly across the street from the Gay, Lesbian and Transgender Community Center. It also strategically sits on the confluence of five different San Francisco neighborhoods or districts. I know where you live–where Satan has his throne. Yet you remain true to my name. You did not renounce your faith in me, even in the days of Antipas, my faithful witness, who was put to death in your city–where Satan lives (Rev. 2:13, 14). Ministry in this city is tough. My heart was deeply stirred by the pastor, Phil Busbee. His has been a difficult road since being in the city. But he has chosen before God to be committed to the vision of speaking blessing to the people in the city and not cursing. We are writing to ask you to pray for Gary and Rhonda Dilley and their family as Rhonda’s mother went home to be with the Lord on June 21. She had been battling a brain tumor for the past several months. This comes shortly after the death of Rhonda’s father in April. They have suffered much sadness in these past few months. The funeral for Evelyn Payton will be at the Feller Funeral Home in Auburn, Ind., on Saturday afternoon, June 24, at 2:00 pm. Visitation will be on Friday from 2-4 pm and 6-8 pm. Feller Funeral Home is located on the corner of Center Street and Auburn Drive. 1 Kings 19:3–Elijah was afraid and ran for his life. When he came to Beersheba in Judah, he left his servant there, 4 while he himself went a day’s journey into the desert. He came to a broom tree, sat down under it and prayed that he might die. “I have had enough, Lord,” he said. “Take my life; I am no better than my ancestors.” 5 Then he lay down under the tree and fell asleep. I’m sure many of you have preached this before. Threat, high-energy encounter, physical exhaustion–together, they add up to depression or even worse, despair. Perhaps a better summary is this: Ministry today is hard. And the further we travel toward the end of time it will increase in its challenges. I hear this sometimes in the voices of our pastors. Cluster meetings turn into gripe sessions–no joy, no victory, no God-sightings. Gossip, critical spirits, and defensiveness seem to reign. Where is God in this? Where is a sovereign view that says that even if everything is falling down around me, yet I will praise Him (Habakkuk 3:16-19)? Where is the rejoicing when the way is rough because of the spiritual character that is produced at such times (James 1)? Where is the focus on the “audience of one” concept that says even if everyone in my church is against me, I will take my stand because I know the Lord will cause me to stand (Ephesians 6:10ff; Ezekiel)? 21 Jun Deer Are Doing Fine on the Ranch! I have just returned from a brief vacation. My wife EJ and I flew to San Antonio, Texas with our daughter and her family. We spent about a day and a half touring the Alamo and the River Walk. We ate in some fine establishments and I was able to locate several excellent ice cream shops, which is always a priority for me. We then rented a car and drove northwest of San Antonio to Whitetail Junction Ranch. We spent several days with my nephew, niece, their spouses, plus two great-nieces and one great-nephew and their spouses. We had a nice little family reunion. Now the reason I’m telling you all of this is to say that the deer are doing wonderfully on the ranch. After purchasing a ranch populated with sickly deer, my nephew intentionally bred strong young bucks to improve the DNA of the herd. Last year one of them topped out at about 280 pounds. I don’t know exactly what the B & C score was, but it was high. So the DNA change is working. As I drove my little four-wheel cart around to look at the animals, I was again amazed at how much has been accomplished in such a short time. Or you can listen to the Podcast of my talk to the youth pastors earlier this year from Daytona Beach, Fla. Many have already heard me tell the story of the ranch and changing the DNA of the herd. The moral of the story is this: I believe that just like a sickly herd of deer is changed by bringing in new bucks, in the same way we must change the DNA of our leadership. Many of you have heard me say this before. Nothing new. But I wanted you to be aware that after my latest trip to the ranch, I am as firmly dedicated to this task as ever. Will there be opposition? I would be greatly surprised if there wasn’t. Will many desire that we just let well enough alone? I imagine that will be true. But my question is, are we “good enough”? When it comes to our leadership, I’d say no! Now don’t get me wrong. We have some excellent leaders who are doing an effective job leading. My point is that we just need more of them. I want to find more new leaders while at the same time try to create a desire in many of our churches for something more, something better when it comes to ministry, so that when we find the “bucks with new DNA” we will have situations in which they can reproduce. I would imagine that we have some churches that really don’t want to change, or don’t want to see growth if it means change. Maybe only a few will really have the “stomach” to make the necessary changes to become effective again. I say “again” because most churches at one time in their history were probably somewhat effective. Some may want to be effective again and some may not. But I will say this to our churches: if there are any out there who really want to become effective in their ministry and are willing to make the necessary changes, call me! “Effectiveness” can mean different things to different people. What it means to me is a church that will do whatever is necessary to fulfill the Great Commission by seeing everyone become fully devoted followers of Jesus Christ. I suppose a church could be “effective” doing a lot of different things. But if people aren’t becoming fully devoted followers of Jesus Christ, then all the effectiveness is just so much busyness. If people aren’t becoming fully devoted followers of Jesus Christ, we almost forfeit the right to have the name “Church” on our sign. Without that happening, whatever else we do is just a social club of good works. So, the deer are still growing on the ranch in Texas, and my dream for a new DNA within the “ranch” of the Church of the United Brethren in Christ is still burning hot in my soul. 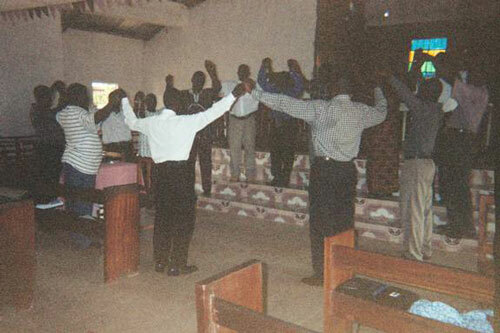 A prayer meeting in Bo. Joe Abu, senior pastor of Mount Zion United African Church, a UB congregation in Philadelphia, recently returned from a trip to Sierra Leone, his homeland. Last December, he traveled to Sierra Leone with Gary Dilley, Director of Global Ministries. This time he went on his own, with a desire to help his countrymen. Joe reported the following highlights. “Resilience of Sierra Leoneans. Very soon after the long and devastating civil war, I was astounded by the resilience of the people as noticed in the churches and everywhere. In spite of the psychological and other effects of the war, the people are happily forging ahead, rebuilding their homes and lives. “Body Without Head. Even though the body of believers (the Church) has been without a functional head (leadership) for quite some time, it is important for donors to know that their prayers and donations for ministries in Sierra Leone have not gone in vain. Comparatively, we have more churches flourishing today than any other time in the history of Sierra Leone. Some of the Churches are not only growing numerically into self reliance, but also growing spiritually as evidenced by their involvement in conversion, discipleship, baptism, etc. This is not any insinuation that the situation here is perfect. But it is rather unfortunate that we tend to hear more about the negatives about the ministries than the positives. If the local churches are thriving without proper leadership, there is no doubt that they will accomplish more if we continue partnering with them until the Lord blesses them with a sustainable leadership. I encourage you to come with me to see for yourself. A memorial service will be held in Daytona Beach the last week of June.